2.5 hours on this today, 9.5 in total. Gradually coming together, still a lot of work to do though! . Another 2 hours on this today, 7 hours in total so far. Have to admit, I didn't really enjoy working on it today... perhaps the slow enormousness of the painting having been focusing on quick life studies this last week? Updated the time lapse video, it is below! Today I worked on strengthening the darks, and then the highlights. Went over the lot with a big soft brush afterwards to remove any brush marks, soften it all up, and leave a nice smooth surface. Should be a good basis for the next layer I hope. 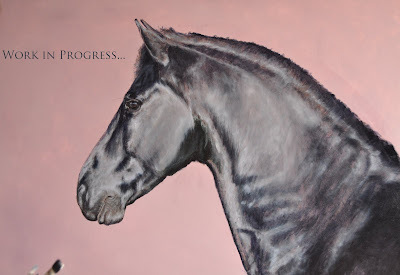 Still a very long way to go, a small image on a computer screen always makes large paintings look much neater and more finished than they really are! This photo of it was taken from one of the time lapse shots as my camera run out of battery just as I stopped painting, hence the brush creeping in the shot! Another hour spent painting my Beswick project muse! Number 2 complete. Plenty wrong with it BUT I am actually quite pleased with it compared with the first attempt yesterday, big improvement I think. Really enjoyed it, wonder if I'll still be saying that by day 30?! Haha! Same palette used today as yesterday, mainly because I am lazy and just used yesterday's palette! Painting number one- done! Finally off and away with this project! I spent an hour on it this morning. It's suitably dreadful as my first one, I am really excited about hopefully seeing myself improve with each one I do though! I just know that this project will really help develop my life painting skills. 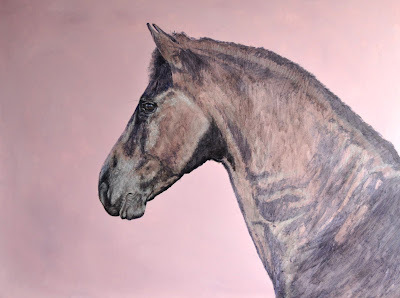 I plan to get all 30 paintings done before the next equestrian life painting workshop and have my fingers crossed that I will reap the rewards of my hard work in the quality of the paintings I produce there. 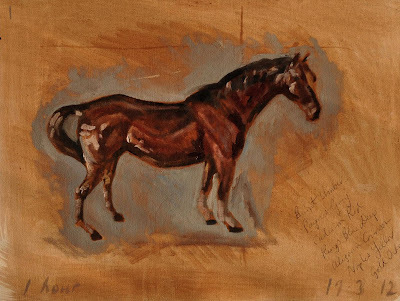 Lots and lots wrong with this first painting... neck too long, serious feet issues, front legs too chunky, colour way off, I could go on and on! BUT it's a starting point to move forwards from! Back from a fantastic weekend away painting at a workshop alongside several other equestrian artists! 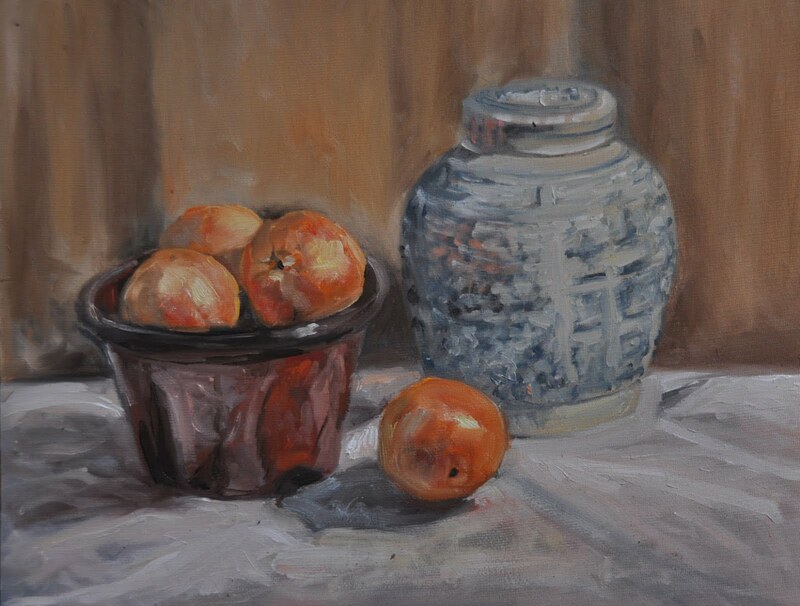 No horses this time- just vases, pots, and oranges! Very tricky but I had great fun and learnt loads, as I always do at these things- feel very lucky to have such an incredible tutor in Malcolm Coward, very lucky indeed! Super-excited about the next few workshops coming up... lots and lots of painting horses from life planned, *can't wait*! 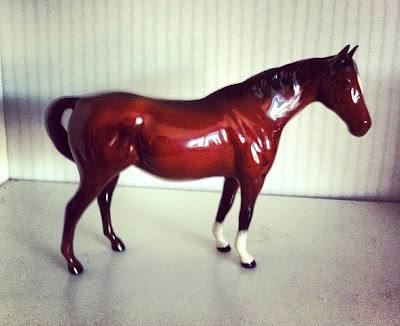 I have been spurred into cracking on with my little Beswick project, will blog separately about that though! Another 2.5 hours spent on this today, so 5 hours in total. A dark transparent layer of paint over the lot, and then some concentrated work on the muzzle, and then the eye. I have decided to make the current layer as detailed as I can, because the painting is so big I have had to find a way to break it down in to manageable chunks timewise. Pretty happy with it so far, think I will have a good basis for the next layer of detail and will perhaps have saved some time too. Below is a photo of the muzzle close up; still plenty of work left in it- determined to try and make it as realistic a painting as I possibly can! Managed to make a proper start on this 36" x 28" painting today, have just roughly marked out the main areas of light and dark over the background colour so far, I suspect it's going to be a very long project with many layers of paint! It's the first big painting I have attempted in a while, and probably the biggest head portrait I have ever done, so all that space is looking quite daunting!  Determined to make it my most convincing painting to date, fingers crossed! Been refreshing my memory on the time lapse video front too, here's a quick snippet- about 2.5hrs in 16s!! Meet Bessie the Beswick mare. This is the ornament that I was planning to paint, daily, for 30 days, as a bit of a project to try and sharpen up various observational and life painting skills! 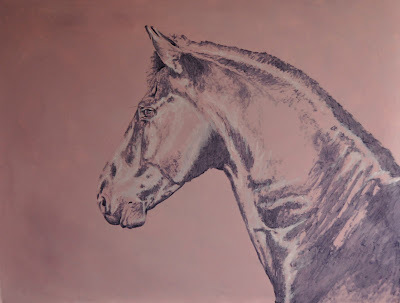 I'm still planning to paint her 30 times, but I have decided that I am going to struggle to give it my full attention for 30 consecutive days, so am removing the time limit! 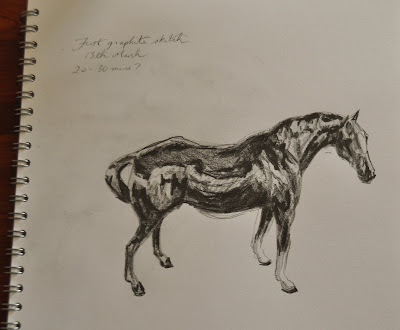 Sat and did a little sketch today, pretty dreadful, paint is so much easier to correct with. 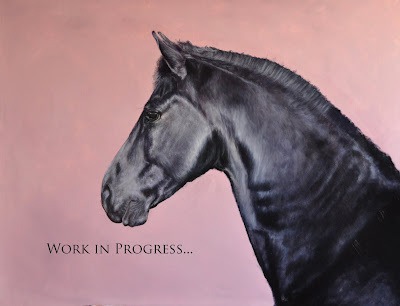 Hoping to sit down and produce painting number one this evening! Really hoping to see a massive difference between painting number 1 and painting number 30!! My family and I are relocating from County Durham to Leicestershire with my husband's job, so a mass clear out has ensued! 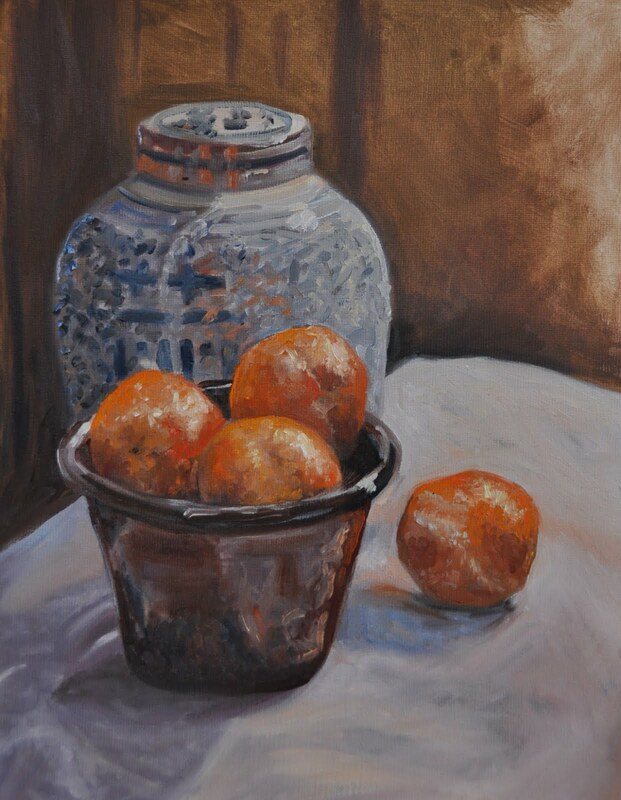 Have decided to dutch auction a couple of paintings, starting with this framed 12" x 10! 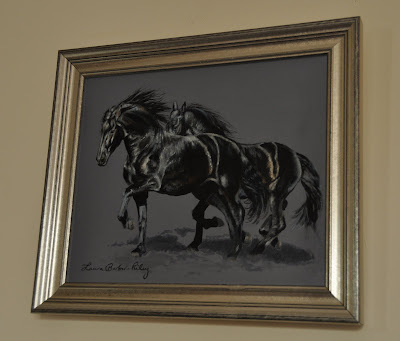 The original price was £280, it drops by £20 each Monday until sold- currently at £180! To purchase simply contact me at info@laurabarber-riley.com or on 07779613649. 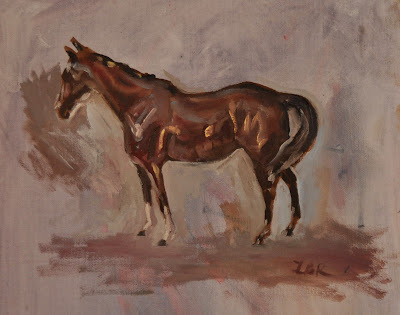 Looking forward to a weekend of still life painting and tuition this weekend with a group of equestrian artist friends! Background base colour on! 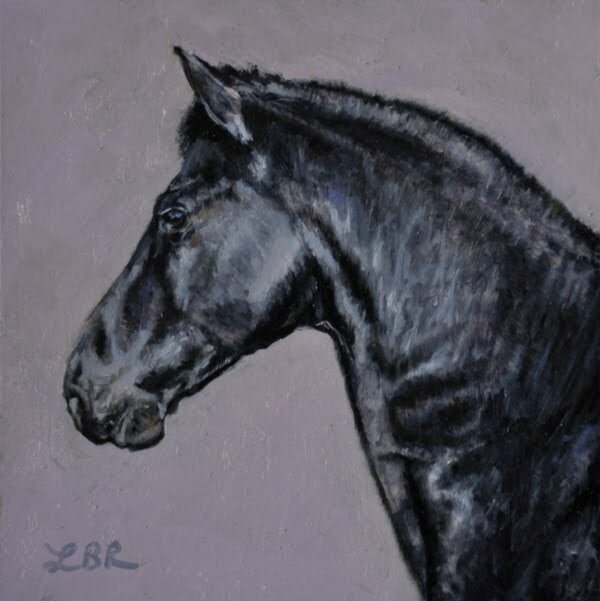 This is the painting that the little 6" x 6" study 'Portrait of a Black Horse' (below) was in preparation for, can't wait to get going with it, the first large painting I have done in a long time!